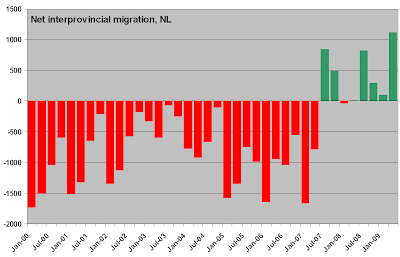 Newfoundland and Labrador’s population increased by almost 1,400 people from April 1 to July 1, 2009, as a result of continued in-migration. The Honourable Jerome Kennedy, Minister of Finance and President of Treasury Board, said the province’s population has grown by 2,484 over the past year to 508,925. “We expect to see continued migration to the province over the next number of years as projects such as the Voisey’s Bay processing facility, White Rose Expansion, Hibernia South and Hebron result in a significant increase in capital investment, resulting in additional employment opportunities for people to move to the province,” the minister said. Read it carefully: other than a throw-away line to "additional employment opportunities", the guy who was Finance Minister that week was very careful not to attribute the phenomenon of net in-migration to employment fundamentals. "I am pleased that our province’s population has increased again this quarter as a result of significant net in-migration of 1,070 people which offset a natural decline," said Minister Kennedy. "Quarterly net-migration reached its highest level in 37 years and remained positive for the fifth consecutive quarter." "This is exciting news for our province and is reflective of the renewed confidence that exists among Newfoundlanders and Labradorians here and abroad," said Minister Marshall. "New resource projects, such as the recently announced Hebron project, along with others on the horizon – the Lower Churchill, the VALE-Inco facility in Long Harbour, Hibernia South, White Rose expansion, expansion of the Iron Ore Company of Canada mining operations and the potential expansion of the Come-by-Chance oil refinery – will create even more employment opportunities in our province. Given the province’s strong economy and bright future, we are optimistic that we will see continued population growth in the years to come." And lastly, in reverse chronological order, the once-and-future FinMin from last June. Now, here's the thing: not only is there no evidence of a cause-and-effect relationship between the economic situation in the province and the late spate of net interprovincial in-migration... there is, in fact, evidence of an inverse relationship. This chart shows the net interprovincial migration figures (in persons) for each quarter since Q1 2000. Negative/red bars are quarters where more people moved out of the province to other parts of Canada than moved in; positive/green bars are quarters where more moved in than out. 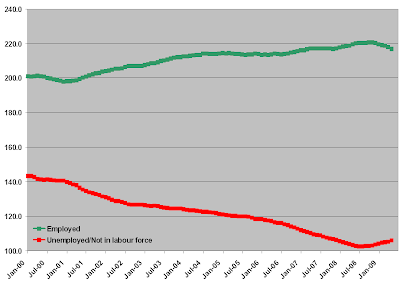 And this chart shows labour force statistics (in thousands of persons), as a trailing annual average. For example, the figure for December 2007 is the average of the twelve months leading up to, and including, that month. This smooths out the significant seasonal fluctuation, and brings long-term trends into sharper focus. persons who are not participants in the labour force, less those in age cohorts 55 and up: most of the non-participation in these age brackets is due to retirement. Interpreted through labour-economic terms, interprovincial migration usually reflects a combination of "push" and "pull". Provinces lose population when their own economic weakness "pushes" people out, or when the lure of booms elsewhere "pull" them away. Notice here that the in-migration trend actually pre-dates the peak of employment (and valley of un-employment and under-employment) by a couple of quarters. Notice as well that the unemployment picture has actually been getting bleaker at the same time that in-migration has been trending up. In other words, the labour market data show no signs of an economic "pull" going on, which significantly reduces the number of explanataions available for the recent in-migration trend. It also increases the amount of salt which one should take along with the eboulliant quarterly press releases from the Ministry of Optimism. And finally, it would explain — especially if Ministers have received any written briefings on demographic and labour-market trends — why a succession of FinMins now have been so guarded in their language, so reluctant to attribute in-migration to anything real, and so eager to talk about possible jobs that may exist in the future, not actual ones which do exist in the now.